Why would Georgia legislators force taxpayers to buy the most expensive, least secure type of voting system? Why would a governor take out a20 year bond to pay for a system that has a 10 year life span? Why would a bill authorize new devices to tabulate embedded votes in unverifiable bar codeswhen six systems tabulate human readable votes? Where is the fiscal note? The answers might be found in which vendors have the most powerful lobbyists. HB316 has vendor specific language that favors an expensive system proposed by the incumbent vendor, ES&S. The bill attempts to subvert Georgia’s official full face ballot by authorizing small receipts with barcoded voting selections called “scanning ballots”. The small receipts that studies have proven to be unverifiable are produced by a system that ES&S wants to sell to Georgia and ES&S has doubled down on their lobbying efforts. Former lobbyist Chuck Harper is now the Chief of Staff for Gov. Kemp. ES&S also employs Georgia Link to lobby Speaker Ralston. Founder John “Trip” Martin is from Blue Ridge, the Speaker’s hometown. In 2002, Lewis Massey successfully lobbied the state to purchase Georgia’s current highly criticized system. He then formed a partnership with Bruce Bowers and John Watson, the current chair of the Georgia Republican Party. They lobby for Unisyn a small voting system vendor that also proposed a system using a similar type of “scanning ballot”. These two vendors and their lobbyists could benefit if specific HB316 language tailored to their systems passes the Senate today. 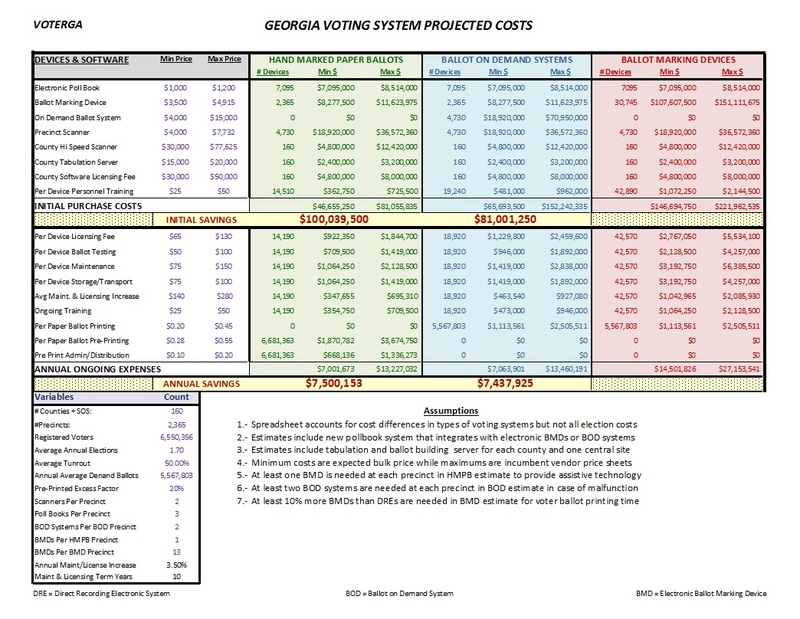 VoterGA cost estimates confirmed by a new study from the Open Source Election Technology Institute show a statewide implementation costing taxpayers over $150 million initially and over $15 million annually. That is over $100 million more and $8 million more annually than systems which are more secureaccording to experts like Trump 2020 advisor Tony Shaffer. The $50+ millioninterest on the bond exceeds the entire cost of a more secure system preferred by experts. Total outlay surpasses $350 million over the next 10 years alone. The state has already been notified that defiance of all cybersecurity experts will lead to extended federal lawsuits that will cost Georgia taxpayers millions more to defend. It also risks federal intervention into Georgia elections. These are just some of the reasons why HB316 has been dubbed a vendor bill, not a voter bill.